Ugly scenes played out in Kazakhstan on March 22 as police rounded up protesters who took to the streets calling for change as the country enters a new era under freshly installed President Kassym-Jomart Tokayev. 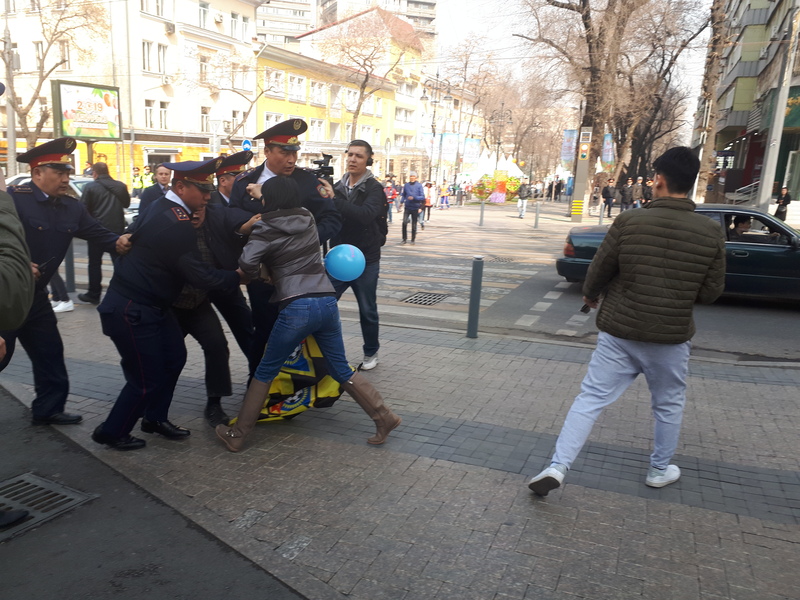 Eurasianet watched as police in downtown Almaty, the country’s business capital, hauled away some two dozen people in scenes that contrasted starkly with the surrounding revelry to mark the annual Nowruz spring equinox holiday. The grievances of demonstrators included long-standing frustrations over the quashing of civic freedoms, the government’s continued inability to effectively spread prosperity and the recent surprise renaming of the capital city. As his first initiative following his inauguration on March 20, Tokayev proposed changing the name of Astana to Nursultan in tribute to outgoing President Nursultan Nazarbayev’s three decades of rule. Nazarbayev had startled the nation one day before by announcing his resignation. That decision provoked a broad spectrum of emotions. Those who turned out to demonstrate on March 21 and March 22 in cities like Almaty and in what must now be called Nursultan were at the frustrated, angry end of that spectrum. “I’ve come to express my contempt for the corrupt system that’s been created over the last 30 years,” one man told Eurasianet, before police grabbed him. Although Nazarbayev is no longer head of state, he will still retain wide-ranging powers for life, monarch-like, that will permit him to pull the strings from the sidelines. As he was being detained, another young man expressed frustration over this arrangement by reprising a slogan that has featured at previous demonstrations in Kazakhstan in recent years. “Nazarbayev out! Shal ket! (Old man out! )” he shouted, thrusting his head out of a police truck window before officers pushed him roughly back in. “We’re against the renaming of Astana to Nursultan,” one woman declared at the impromptu Almaty demo. “We are the people. What about our opinion? Where is the guarantee of our rights and freedoms?” An online petition against the renaming has gathered 42,000 signatures — a particularly notable feat in light of the fact that the petition website has been blocked by the authorities. There were arrests on March 21 and March 22 in what used to be called Astana during protests against the renaming. Among those detained was RFE/RL reporter Svetlana Glushkova. “I feel sorry for those young people [arrested],” said one middle-aged woman sitting on a bench in the sun watching children play on wooden swings. Tokayev came to power pledging continuity of Nazarbayev’s policies. As his rule entered its third day, he has proved that, just as under Nazarbayev, peaceful protest remains a crime in Kazakhstan.